'About this time the Sound began to show signs of freezing, and it was interesting to watch the process. As the cold wind smote the water, which was of a much higher temperature than the air, clouds of vapour arose... The vapour, as it condensed, froze the air, and fell back in minute particles of ice into the sea: also, as the wind agitated the water into spray, this, too, froze and formed into slush, which speedily congealed into solid ice as soon as the wind subsided. Then again, when the sea was still, needle-like crystals could be seen forming under water, and tiny flat crystals also; these would float to the surface and quickly freeze to each other, forming thin frozen discs. If no wind came to disturb them, these little discs... would rapidly increase in size and become 'pancakes,'... as the pancakes grew bigger and lay in contact with each other, crystals would shoot across and knit them firmly, until the whole surface of the water was covered with a mosaic of little floes... gradully fitting themselves together... and so it went on until there came a day when the whole of McMurdo Sound was locked in the embrace of King Frost. 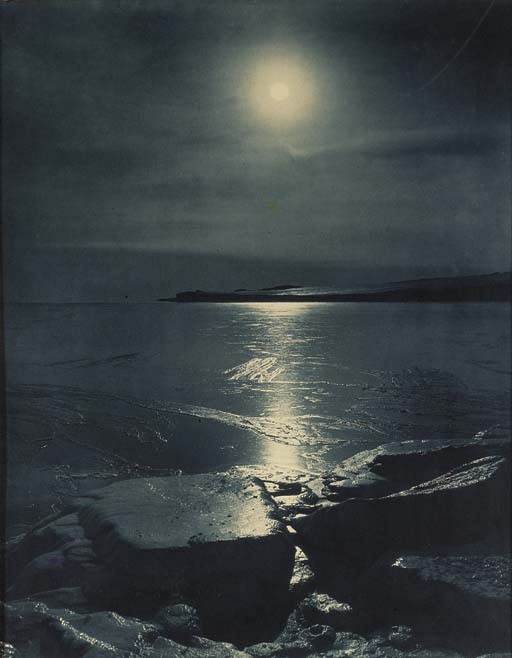 But for weeks the ice kept forming on the sea and breaking up again.' (H.G. Ponting, The Great White South, London, 1921, pp.105-106).